Looking for something different to make with turkey? Try this Hue style spicy vermicelli noodle soup. It's a great way to bestover your leftovers! I’m all about leftovers. I mean, once, when I was at a party, someone asked how everyone liked to eat their Thanksgiving leftovers. I literally said that I like to make myself a plate that looks just like Thanksgiving dinner. I kind of got some weird looks and when everyone else answered, I realized why. Most people were saying things like turkey chili, sandwiches, turkey alfredo pasta, things like that. But really, I mean, I LOVE turkey dinner and don’t understand why people get tired of it. But, as much as I love straight up leftovers, I really really like using leftovers to make entirely new dishes. 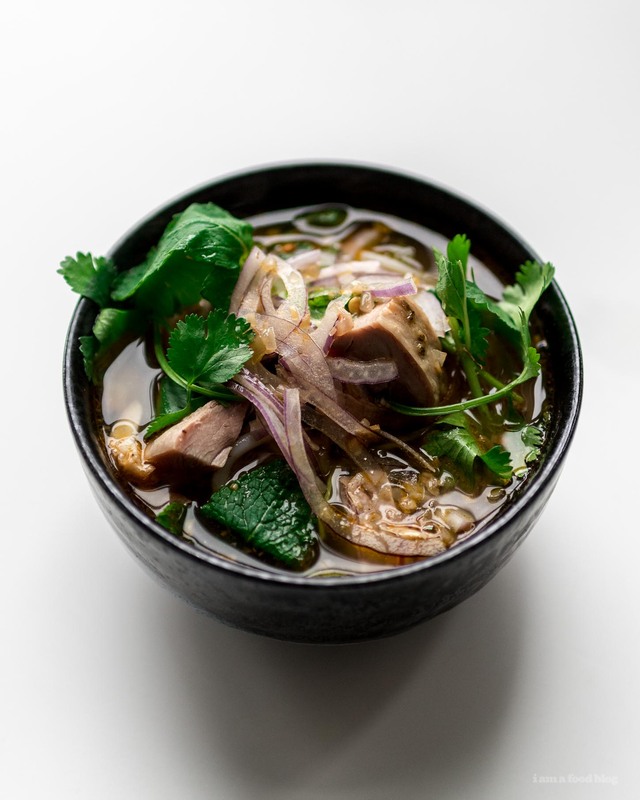 Dishes like this spicy turkey vermicelli noodle soup, a take on Vietnamese bun bo hue. Hue style soup is so good. It’s lemongrass-y, spicy, and incredibly addictive. 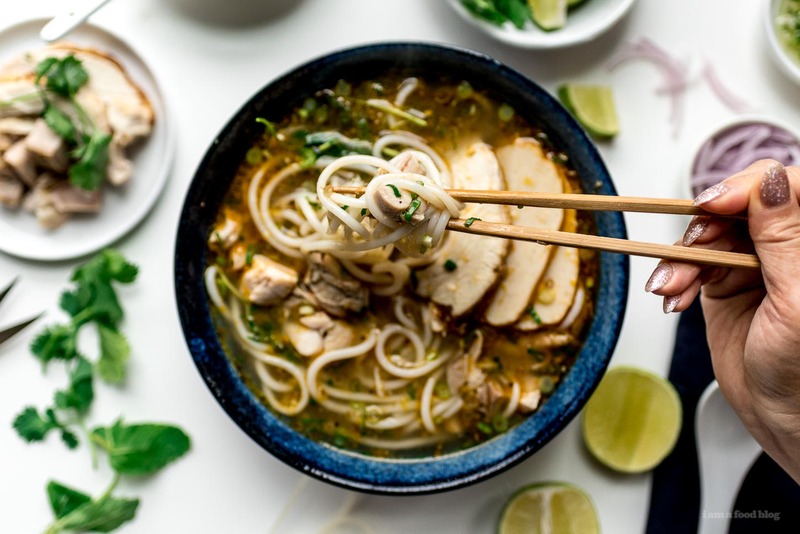 If you like pho, you’re in for a treat because hue noodle soup is like pho but turned up times ten. 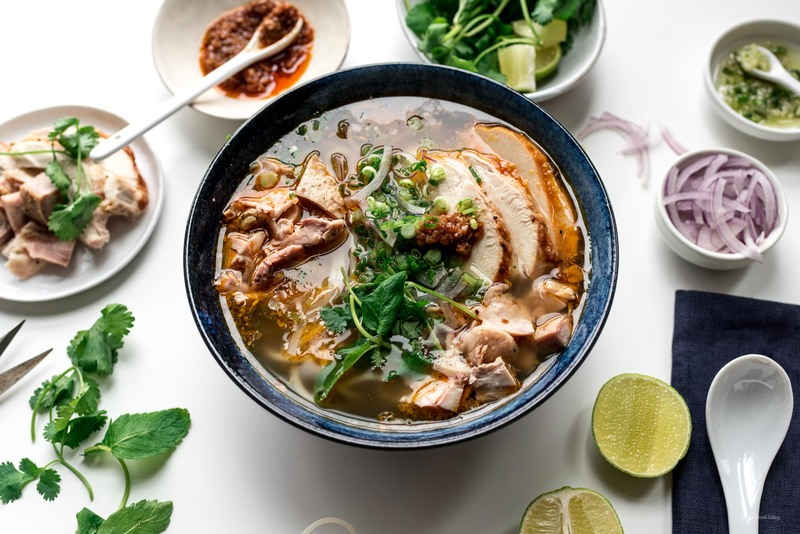 Traditionally hue noodle soup is made with beef, which is why it’s called bun bo hue. Bun means vermicelli, bo means beef, and hue, well, that’s an area in Central Vietnam. So, this is kind of like bun turkey hue: vermicelli turkey in a hue style soup. The best part of this dish, aside from the fact that it’s delicious, is that it comes together pretty fast. Start off with your leftover turkey bones. You did save the bones right?! Pop those in a pot with some bruised lemongrass, garlic, shallot, and rock sugar. Bring it to a gentle boil, then pop it in a low oven – the low oven is awesome because it controls the temperature and fills up your house with amazing smells. You could do this in a slow cooker too, but Mike and I are big fans of making stock in the oven. While that’s going, you need to make your spicy oil. 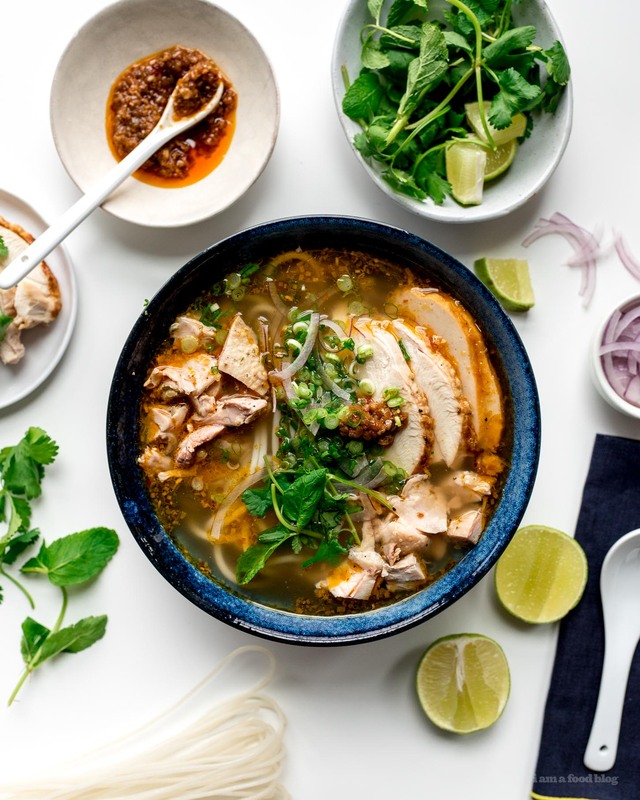 This is what gives bun bo hue it’s signature spicy red look. The red is from annatto seeds and the spice is from chili peppers and flakes. It also has minced lemongrass and shallots. You use it to flavor the lemongrass stock and because it’s not in the base stock, you can make your soup as spicy or as mild as you like. 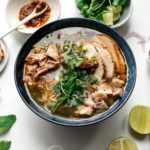 When that’s done, it’s just a question of cooking up some noodles – traditionally they use very thick vermicelli – and topping off your bowl with a generous amount of lemongrass turkey stock, your homemade chili oil, leftover turkey, and fresh herbs. There you have it! Leftovers into very possibly the very best bestovers you’ll ever have! Adjust the racks in the oven so a large pot can fit in the middle and heat to 200°F. Place the turkey, lemongrass, garlic, shallot, and rock sugar in the large pot and top with water. Bring to a gentle simmer on the stove, over medium heat, then very carefully transfer to the oven, uncovered and keep in the oven for 2 hours. 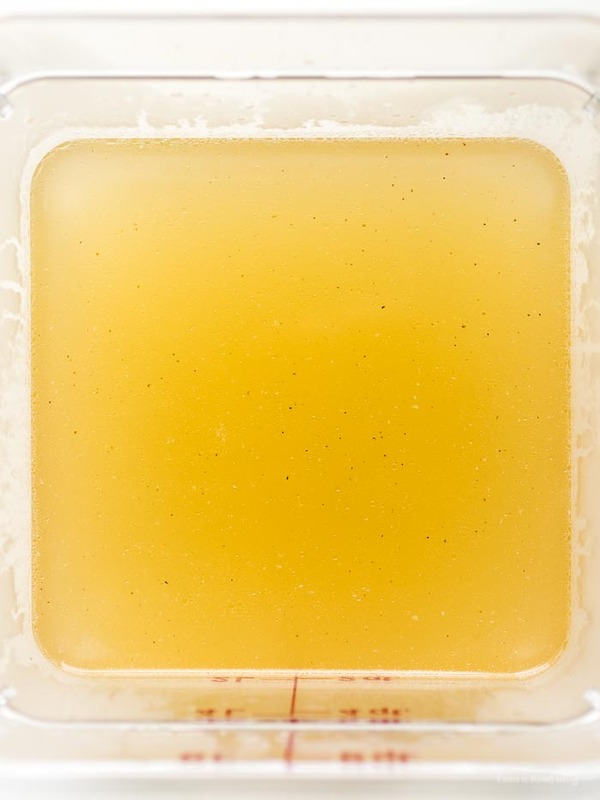 While the stock is going, make the chili oil: in a small, deep sauce pan, add the oil, annatto seeds, and chili peppers. Heat up the oil over medium low heat, stirring often, until it smells aromatic and the oil is red. Remove from the heat and very carefully use a fine mesh strainer and strain out the annatto seeds and dried chilis. Add the oil back to the pan. Over medium heat, stir in the shallots, garlic, and lemongrass. Cook until the shallots just begin to soften, without browning, about 2-3 minutes. Remove from the heat and stir in rock sugar until dissolved, then stir in the red pepper flakes, fish sauce, and shrimp paste. Remove the stock from the oven and carefully strain into a large pot. Season it with fish sauce, by the tablespoon until it is aggressively seasoned but not overly salty, about 3-4 tablespoons. Keep the stock on a low boil. Notes: You can find annatto seeds and shrimp paste at Asian grocers. The seeds add the red color as well as a nutty, peppery-sweet flavor to the stock and the shrimp paste adds that extra oomph. The shrimp paste is VERY smelly on it’s own, but it’s kind of essential if you want an authentic flavor. It looks like this and you store it in the fridge after you open it. If you don’t have rock sugar, substitute regular. It looks so good! Wouldn’t mind a bowl in this stormy day :) Definitely will make it soon. Thanks for the recipe! Is there a substitute for annatto seeds? unfortunately, no. i know that some people use paprika to color their oil but it doesn’t have the same intensity or aroma. they sell annatto seeds at most grocery stores in the states though, in the mexican section! I’m not even the one cooking the turkey this year, but I’m seriously considering cooking an extra turkey just so I can make this. It looks wonderful! This sounds like the noodle soup of my dreams! I’m roasting a chicken for a variety of uninteresting reasons tomorrow, I assume this would work well with chicken as well? and yay! so happy you like the book! Hi Stephanie! I’m going to try this recipe this weekend. At what point do you add the fish sauce to the stock? 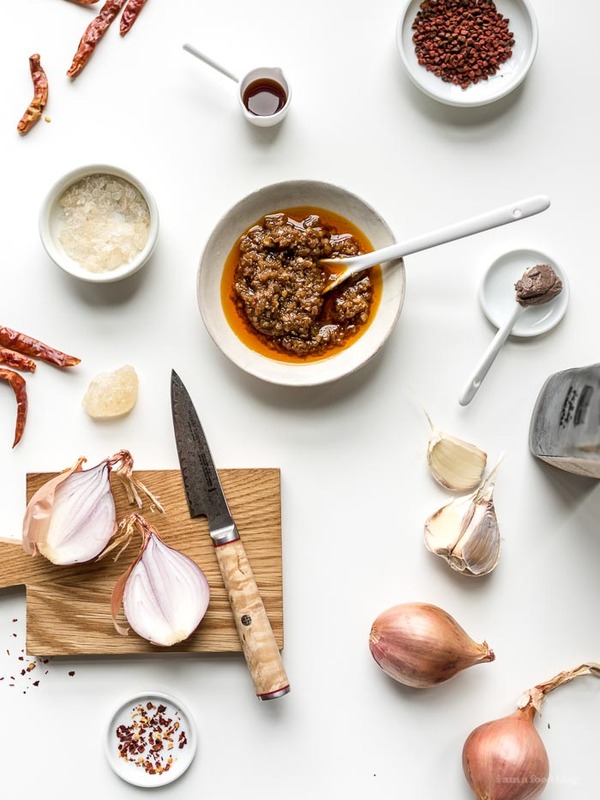 I notice that the fish sauce is listed in the ingredients for the stock, but was left out of the initial stock-making process and assumed it would be added later. you add it after you strain it and heat it up again. thanks for catching that! i’ll edit the recipe. This sounds great! What kind of oil do you use? Thanks so much! This looks to die for! Dang, your photos are seriously amazing and always make me hungry even if I just ate a meal!